"A house is not a home." Rom hides in the woods with Brandy and Steve as the police, unknowingly accompanied by incognito Dire Wraiths, search for him. Eventually, the Wraiths bring out Hellhounds, which are telepathic trackers, and Rom is forced to flee. After dodging Wraith disruptor rays, Rom gets his human charges to safety in an abandoned house. However, the house turns out to be a creature that once fought Dr. Strange, and it tries to capture Rom and the humans. Rom uses his neutralizer to send the House back to Limbo, thereby protecting Brandy and Steve. Story - 4/5: Rom 5 will always have a special place in my heart, for it is the very first issue of Rom I actually bought on the news-stand with my own money (issues 1-4 and 6-23 were purchased years later as back-issues). The book was released in late 1979, right around the holidays. 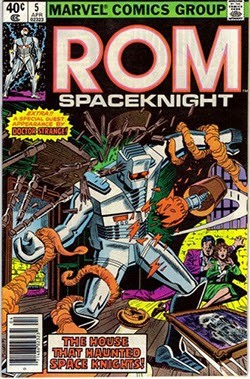 I'm not sure if I had ever heard of Rom before, but I thought the cover looked interesting -- a silver robot battling tendrils of smoke and having furniture thrown at him. Luckily, the story was relatively self-contained, and I was able to understand it easily. I read and re-read this comic so much that it is visibly worn and beaten by now. But for some reason, I did not buy another issue of Rom for a year and a half (my next was Rom 24). Enough years have passed that I no longer remember why I didn't buy more of them, because I truly loved Rom 5 as a kid. In terms of the story, I have always enjoyed this one. The early part is eerie and suspenseful, as Rom hides in the woods and the Dire Wraiths (who only appear as humans in this issue) bring out one tool after another to try and track him. Finally, they call upon their Hellhounds, which in this issue are drawn simply as eyeless dogs. In later issues, we will see what these creatures can really do, but for now, Rom only tells us that they are telepathic, and thus almost impossible to hide from. Once the Hellhounds catch Rom's telepathic scent, he and his human companions have no choice but to flee. He grabs one in each arm, and flies them to safety, dodging Wraith weapons as he goes. There is some interesting interplay here between the Dire Wraiths (disguised as humans) and the actual human police, who demand to know why the Wraiths are sporting these unusual weapons. However, one Wraith poses as a SHIELD agent, and SHIELD was known to have enough high-tech weaponry that the police are somewhat mollified. Even so, once the Wraiths leave, the police continue to grumble about the situation -- clearly having doubts about what they were told. As these events unfold, Brandy Clark's presence awakens emotions for Rom that he has not allowed himself to feel in a long time. There is a wonderful flashback depicting Rom's announcement to his girlfriend, Ray-Na, that he is going to become a Spaceknight, giving up half his humanity. Here we finally see, after five issues, the enormity of what Rom has done -- not merely giving up something of himself, but also giving up his happiness with the woman he loves, all for the sake of his homeworld. Rom comes across as brave and noble, and it is this nobility that Brandy Clark has already sensed, and to which she has become drawn. Rom carries Brandy and Steve to an abandoned house, but it turns out that the house is actually an other-dimensional creature once battled and banished to Limbo by Dr. Strange himself. Believing that only a sorcerer of Dr. Strange's power can defeat it, the house attacks Rom and later taunts him. Rom, however, has power of his own -- namely, his neutralizer. The scene in which Rom brushes aside the attacks of the house and then takes it out with his neutralizer is one of my favorite to this point in the series. Rom is always strong and indomitable, and never surrenders to defeat. Overall, this is another solid issue. Mantlo continues to turn out fantastic stories with tight, suspenseful plots and outstanding narration and dialogue. I simply can't get enough of the Mantlo Bronze-Age writing style, and this issue is a classic example of it. The only complaint I have is that, after the giant words on the cover advertising a "guest appearance" by Dr. Strange, the fact that he is in only a few flashback panels is rather disappointing. I know comic-books have been doing this since the beginning, but anyone picking this title up for the Dr. Strange appearance must have been very disappointed. Art - 4.5: Buscema once again produces excellent artwork. I love the way he draws the face and hands of the house. Also, his depiction of the beauty of the Galadorian Gardens is subtle but still quite lovely. He cleverly gives Ray-Na, Rom's old love, and Brandy Clark, the new love interest, similar, but not identical, faces, so the reader can easily see why Rom has made the connection. He also matches Brandy's pose and facial expression with Ray-Na's to both open and close the flashback sequence. Great stuff! Cover - 4/5: Al Milgrom has cover duty this month, and he is always one of my favorite Rom artists. He does a great job with the suit, and his depiction of Rom's penlight eyes anticipates the style Buscema will use for them in future issues. Whether this is just an accident, or whether Buscema looked at the cover art and decided to draw Rom's eyes that way, I guess only the two of them know. Brandy looks good on the cover but Steve looks a bit old to me. Also, Rom's jet-pack is not drawn quite right. Overall Experience - 4/5: Overall, this is another high-quality outing for the Mantlo/Buscema team. The art and story go together extremely well in this issue. By now, the creative team seems to be firing on all cylinders, and they are starting to establish patterns that will be with us for years to come. Once again, I only give this issue a 4/5 across the board because I know there are even better things in store. There are two interesting notes about this issue. First, "Michael Higgins" is listed as the letterer. Interestingly, about 50 issues later (on Rom #53, I believe, although I might be off by an issue or two), Mike Carlin became the editor of this book, and his assistant editor was named "Mike Higgins." This is too much of a coincidence for me to ignore, so I assume that sometime over the four years following this issue, Higgins was promoted from letterer to assistant editor. As a consequence, I am disinclined to be appreciative of his work, because when Carlin and Higgins took over, the first thing they did was fire Sal Buscema from the book -- which should have been a crime worthy of jail time. The second note is from the letter column, in which the longest letter, a negative one, complains that there are "too many words." I am used to this type of comment today, but I was honestly surprised to see such a complaint in a Bronze Age comic, at a time when abundant writing and explanatory dialogue were the rule rather than the exception. Of course, I don't remotely agree with the letter-writer -- I think the amount of writing in Rom is just about perfect (not as much as in the Silver Age but far more than today). But its presence is interesting to say the least, and is perhaps the earliest evidence I have yet seen of the gradual transition of comics from half words/half pictures to mostly pictures.